Our AWANA program kicks off next week on Wednesday, October 3rd. The first night of AWANA we are inviting the parents of our clubbers to please stay. We will be talking about the changes to our AWANA program and handing out the yearly schedules. Family Dinner from 5:15-5:45 p.m. We will be having hamburgers and hot dogs on the grill, chips, and beans. 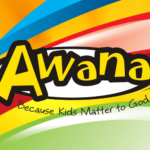 AWANA begins at 6:00 p.m. with our Big Group Time. This will be the time that we introduce the changes, AWANA rules, about the AWANA program etc. Next we will have games and small group time. Games will be in the gym. The small group time will be a time of meeting the AWANA leaders, going over what will be happening in small group time and the yearly verse schedule. The night will finish with a fun snack for the clubbers. We will be finishing the night at 7:30 p.m. The AWANA program will run from 6:00-7:30 p.m. on Wednesday nights. Age ranges for our AWANA program are 4 year old-5th grade. We are very excited for AWANA to begin! We have worked very hard preparing and learning the AWANA program so we can put on a great program for your children!